This package provides a point-and-click interface for exploring the content of DICOM files. At the moment, the functionality provided is allowing to run DCMTK command-line tools dcmdump and dsrdump. Linux: you can download and install 3D Slicer application for Linux, which contains pre-compiled DCMTK tools. DCMTK_PATH should point to the bin directory inside the unzipped Linux package of 3D Slicer. 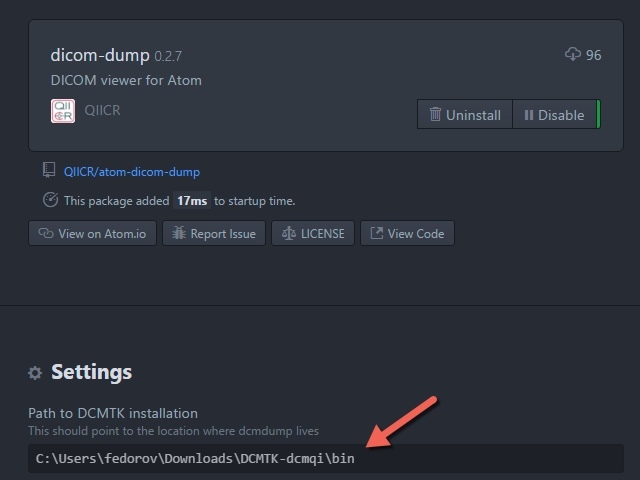 After opening a DICOM file in Atom, use context menu to invoke dcmdump or dsrdump tools. This package is work in progress. Contributions from the community in the form of encouragements, comments, feature requests, bug repots and pull requests are very welcome! This package is being developed by Andrey Fedorov as part of the QIICR project activities. QIICR is supported by NIH National Cancer Institute, award U24 CA180918. Please contact Andrey, join QIICR community on Google+, or submit an issue on the issue tracker!